VATICAN CITY – Always preach the whole truth of the Gospel with humility and respect and never be afraid to offer that truth just “one sip at a time,” Pope Francis told the world’s priests. The Gospel is truth, “brimming with joy and mercy. We should never attempt to separate these three graces of the Gospel: its truth, which is non-negotiable; its mercy, which is unconditional and offered to all sinners; and its joy, which is personal and open to everyone,” he said April 13 during the chrism Mass in St. Peter’s Basilica. 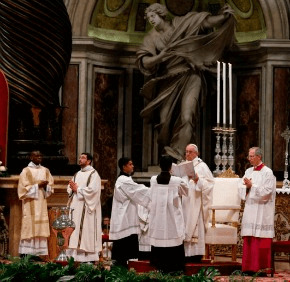 With Holy Thursday commemorating the day Jesus shared his priesthood with the apostles, Pope Francis led the more than 1,500 priests, bishops and cardinals in a renewal of their priestly vows and dedicated his homily to the importance of preaching with a joy that touches people’s hearts. “The priest makes the message joyful by his whole being,” he said, and it is in “little things” that this joy is best shared. The “good news” of the Gospel is not a thing, he said, but a mission that brings “delightful and comforting joy” to the evangelizer. The truth of the good news can never be an abstract truth for those who do not let it fully and concretely shape people’s lives just “because they feel more comfortable seeing it printed in book,” he said in a homily delivered in Italian. “The mercy of the good news can never be a false commiseration, one that leaves sinners in their misery without holding out a hand to lift them up and help them take a step in the direction of change,” Pope Francis said. The Holy Spirit always helps communicate the joys of the Gospel in many, different ways for every age, every person and every culture. he said. The pope then offered priests three images of “three new wineskins” so that the good news may be full and contagious, inclusive and concrete, meek and truthful. Like Mary and the stone water jars at the wedding feast of Cana, be “filled to the brim,” ready and willing to do God’s will and courageously go out to assist others, the pope said. Like St. Teresa of Kolkata and the Samaritan woman who drew water at the well for Jesus, be concrete and help Jesus in his mission, he said. Just as Jesus called to the Samaritan woman, “I am thirsty,” he calls to everyone, and Mother Teresa heard him calling her to take him to the poor and be his light. Mother Teresa was concrete with her smile and the tender way she touched people’s wounds, the pope said. Priests need to be like this – concrete and tender, he added. The last image is the “fathomless vessel of the Lord’s pierced heart, his utter meekness, humility and poverty which draw all people to himself,” he said. “Evangelization cannot be presumptuous. The integrity of the truth cannot be rigid,” he said, because the truth was made flesh, was born a tender baby, and was a man who died on the cross. Let the Spirit tell “us in every situation what we need to say to our enemies” as he illuminates every small step forward. “This meekness and integrity gives joy to the poor, revives sinners, and grants relief to those oppressed by the devil,” the pope said. Later in the day, the pope was scheduled to celebrate the Holy Thursday Mass of the Lord’s Supper at a prison 45 miles from Rome, housing men and women who testified as a witness for the state against associates or accomplices. He was scheduled to wash the feet of 12 inmates. Read more Vatican news here.